One of the perks of being a wedding planner is getting to travel to new venues each year and see beautiful spaces all over Colorado. At Alli and Ricky’s May wedding, not only did we get to visit some new places, but we got to work with a couple that did nothing but make us smile! They were laid back but ready to have a great time, and every detail they chose made this wedding come to life! The day began at St. Francis of Assisi in Castle Rock, and we were far from disappointed! The church was beautiful on its own, but Lindsay from Fairytale Floral made it even more outstanding. Alli and her bridesmaids arrived first to get Alli into her A & Be gown! Once Ricky and his groomsmen arrived, everyone got ready for the first look! Alli and Ricky took a few more photos, but it wasn’t long before guests started arriving and everyone began preparing to walk down the aisle. The two had a full Catholic ceremony, with friends and family performing a few readings throughout. Father Ed made sure to sneak in a few laughs as well. 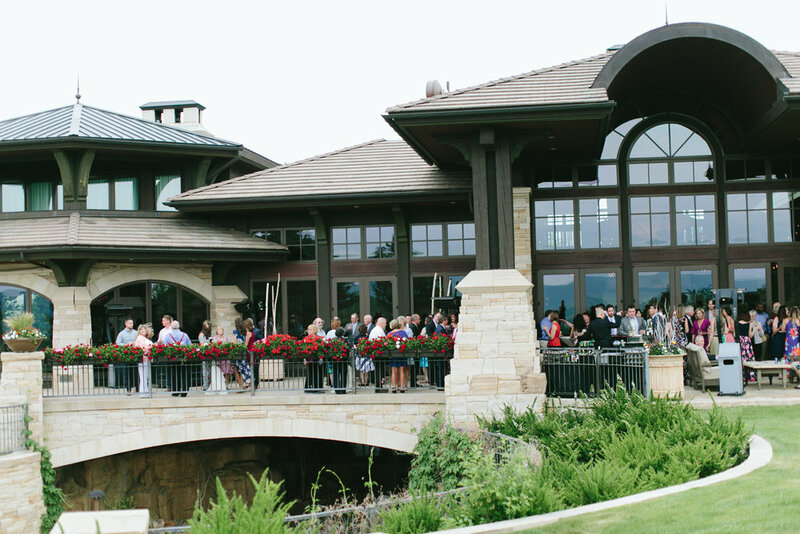 After the first kiss, it was time to head over to The Sanctuary Golf Course! Upon arriving to the reception, guests were instructed to take one or two Polaroids of themselves to add to Alli and Ricky’s guest book! It was a fun touch that made guests feel included and appreciated! Cocktail hour was made more fun by the wedding favors, coozies that were personalized to the couple. The reception space was decorated beautifully with white linens from Chair Covers & Linens, more fabulous florals from Fairytale Floral, and wooden boxes and lanterns made by Ricky and Alli themselves! When guests found their seats, they had a second surprise favor, a bag of seeds for planting! Once tummies were full from the buffet, mini bundt cakes from Castle Pines Bundt Shoppe were set out in all flavors, including snickerdoodle and lemon, but the goodies didn’t end there. Halfway through dancing, guests were surprised yet again with late night snacks! Alli and Ricky danced the night away with their guests with the help of Elite DJ until they were whisked off to their Air BnB and their new life as Mr. and Mrs. Boyd!